How NOT to design your product by noisy minority's opinions? Every product manager knows, through training or experience, that their product has at least two groups of users. Noisy minority and quiet majority. First one is active. They want their opinion to be known. They will gladly give you feedback. They will leave product reviews. They will tell their friends or colleagues about their opinion of your product. The other group, or quiet majority, is the backbone of your product success. Only you don't hear from them. They don't write on forums. Don't answer your NPS surveys. Rarely go to industry conferences. But it doesn't mean they don't have an opinion. Very often they have great, extremely valuable feedback that could massively improve your product. If you already found a way to involve your quiet majority into product discovery, what do you do about the noisy minority? Do you ignore them? Do you listen to them? And to what degree? First of all, you don't ignore the noisy minority. Yes, it's tough. Yes, it takes time and nerves. But it's unwise to ignore any product feedback. Instead, you filter the noisy minority. Good product ideas might come from anywhere. Including a noisy minority. Important to be able to differentiate good product ideas from not so good ones. One way to do that is to compare the feedback noisy minority gives you with the feedback quiet majority provides. A minority might drop a hint, a majority will validate it. Asking why is the deadliest weapon against bad ideas. Some people might get fixated on the ideas they have. So fixated that they will not rest in finding reasons why other ideas are worse. To break this vicious circle ask why a lot. Try to get to the underlying problem behind the idea. Getting to the bottom of a problem might reveal surprising solutions. Both to you and your users. As a PM you want as much feedback about your product as you could possibly get. However, there is one particular group of customers that will always gladly provide you with their feedback. This group represents the minority of your customers but it tends to be very vocal and demanding. 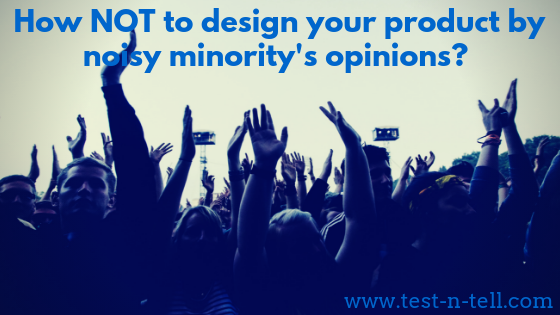 Don't ignore the feedback you get from the noisy minority but validate it and challenge it. Cross-reference qualitative feedback you get from the noisy minority with your other sources of product data. Challenge the feedback with multiple "why" questions to get to the bottom of the problem. Finally, if you have to say "no" - do that with respect and provide reasoning behind your decision.